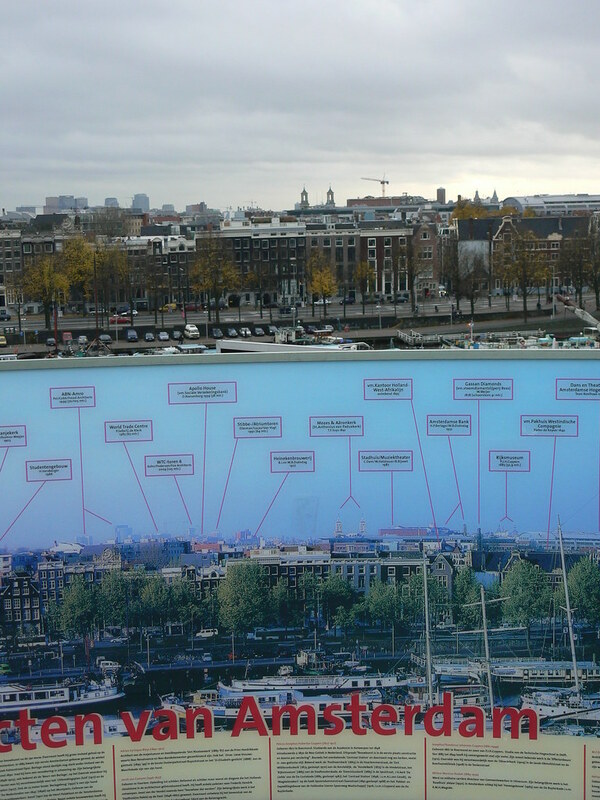 Being one of the most tree-rich cities in Europe, it makes sense that Amsterdam would have a hungry tree somewhere. Here’s one I spotted next to the zoo in someone’s yard. 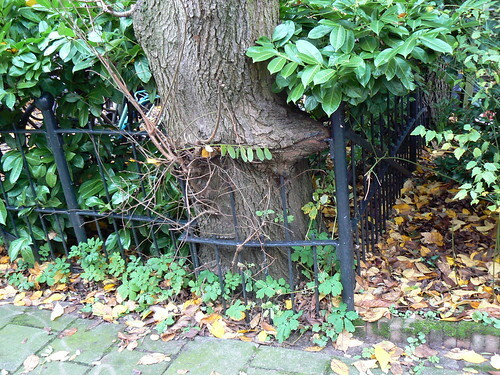 It’s eating a fence. And speaking of hungry, I hope everyone’s appetites get complete satiated today. Me– I’m going to be gorging on delicious Sweet Potato Casserole at my Aunt’s house. On Saturday in Amsterdam, I got to see an episode of the BBC comedy, Outnumbered. It’s about two parents struggling to raise their three energetic and imaginative children. I found myself laughing a great deal. Like Curb Your Enthusiasm, some of the dialog is improvised. However, I don’t think you have to adjust to a different cadence or delivery (With Curb Your Enthusiasm, it took me a number of episodes before I could appreciate the humor). This show, I didn’t even realize improvisation was involved and I was laughing right away. Here are a few clips I found on YouTube. Even in scenes where the outcome is predictable (like that last clip), I think the execution is still so good. Anyway, I recommend keeping an eye out for it on BBC America… or maybe one day it will sneak its way to Netflix. P.S. It looks like they are going to try a U.S. version of Outnumbered as well. Here is another extinct thing I may get to see one day! And if seeing it is special, then just imagine how special you are if you get bitten! Sharon Gursky-Doyen of Texas A&M University has the “dubious honor of being the only person in the world to have been bitten by [a pygmy tarsier]” Something for me to aspire to! The NEMO Science Center resembles a big ship. Inside, of course, you have all the great displays, many of which are hands-on. Outside, on the deck to the ship, you have a great view of the city! 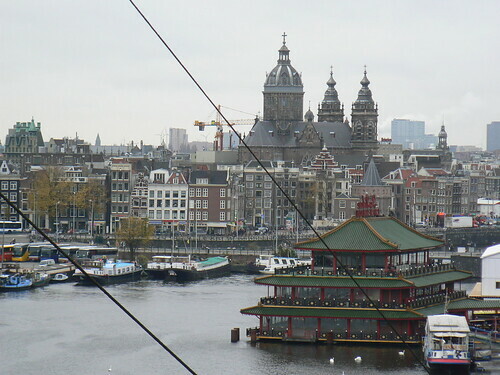 I was in Amsterdam for a day trip in 1995, well before this center was in place. So really, a Season Compare was far from my radar. But wait! 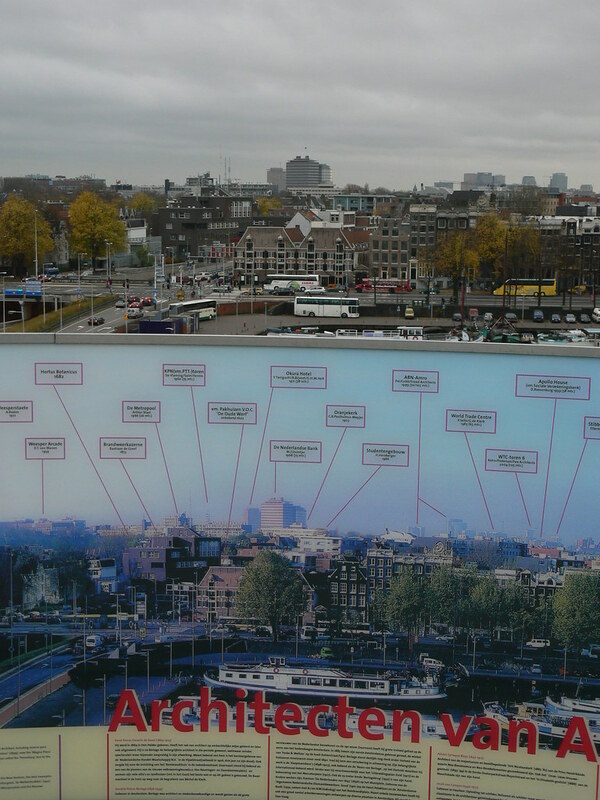 At the top of the deck, there was a nice panoramic display detailing the different landmarks you are looking at. And, whoa! They just so happened to take their panoramic pictures during the summer. As a result, in each direction I looked, I had an on demand season compare! More pictures of NEMO Science Center can be found on my Flickr site. On Sunday, after visiting the closed Energetica Museum, Somma and I wandered over to Wertheim Park. This small but inviting park is a remnant from when France occupied Holland– the land was originally a gift to the city from Napoleon. Today the park houses a reminder of another wartime occupation. Wertheim Park is home to Amsterdam’s Auschwitz Memorial. Before the German Invasion, there were 140,000 Jews living in the Netherlands. After the war was over, only 5,200 had survived the concentration camps and returned. That means roughly 96% never made it home. 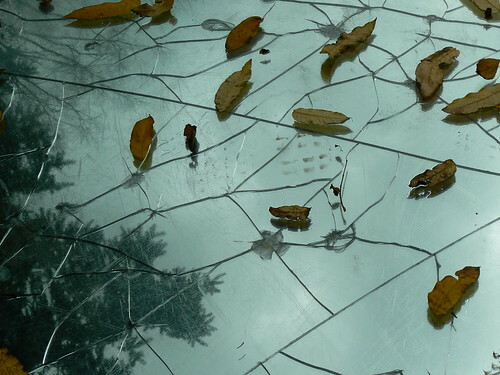 The memorial in Wertheim Park consists of panels of broken mirrors on the ground. It reflects the sky which, having witnessed such atrocities, will be “wounded forever“. I believe it was well planned to have the memorial surrounded by such a simple, but lovely park. 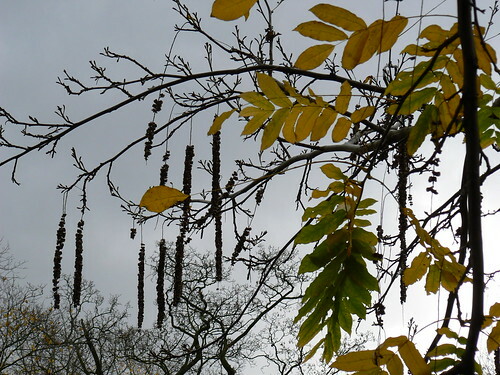 Just as brief glimpses of a horse chestnut tree brought Anne Frank happiness, the park can remind us about the beauty admist the varied and ugly sins of our past… and present. 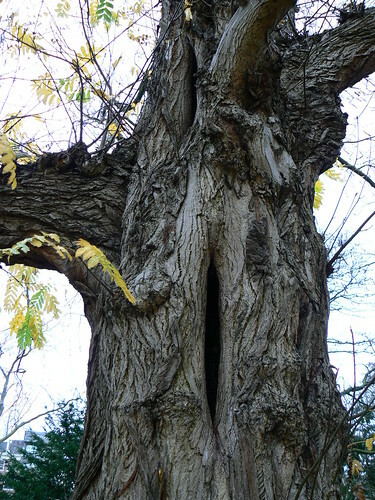 A large tree stands in the park, nearby the memorial. The twists and knots in its bark, document the trials of a long life. It has taken its wounds, continued on, and grew into something more rugged, more stable, yet inspiring and beautiful. If a tree can do it, perhaps then, so can mankind. 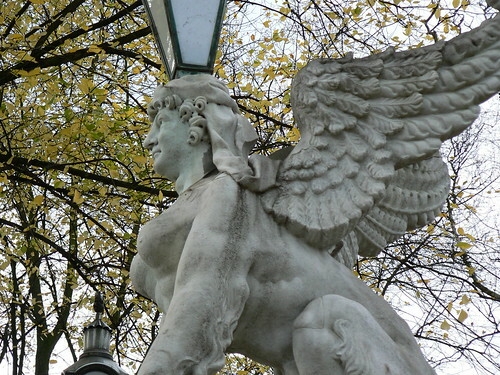 More pictures of Amsterdam’s Wertheim Park are available on my Flickr site. 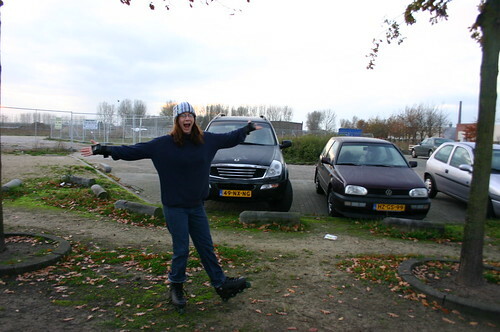 The fifth country I have rollerbladed in is…the Netherlands! It didn’t look too promising at first that my skates would get a chance to leave my suitcase. It was rainy the first couple days in Amsterdam and the first two days in Bergen op Zoom, we stayed at the customer site past dark. My very last night in the Netherlands, however, we got off work with enough daylight to pay a parking ticket AND for me to sneak in a skate in Bergen op Zoom. 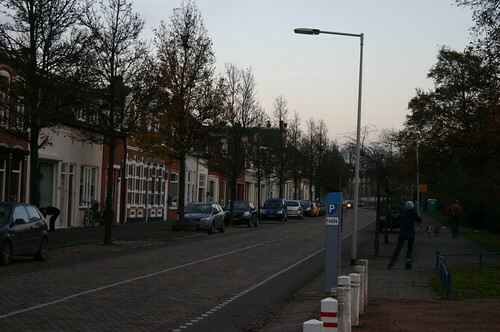 The pavement wasn’t exactly optimal– it was a stone walkway that was still damp and had pockets of fallen leaves.The outing was pretty short as it was getting dark and I still had to drive back to Amsterdam. 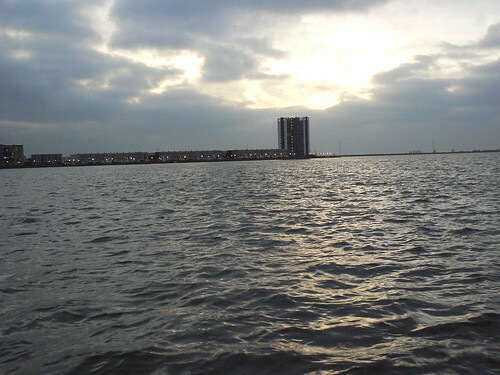 But, I did manage to get my heart rate up and I managed to stumble on a scenic water front. So all in all, my 5th country provided a pretty nice skate. P.S. For the other rollerbladers out there– The next day on the way to Schiphol Airport in Amsterdam, I did spy a very nice, smooth, bike path nearby. I also read that Vondelpark would be a good place to go. On the way to the closed Energetica museum, Ryan Somma and I passed a large crowd congregated around the canals. “What’s going on?” I asked an equally stumped Ryan Somma. 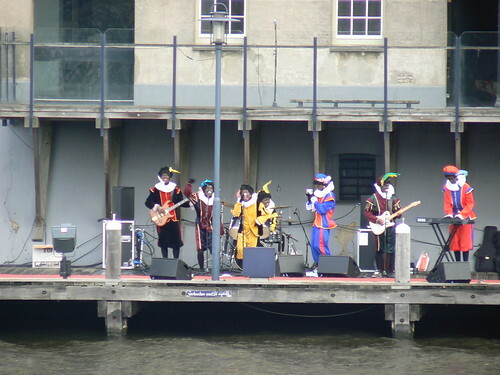 But then a band started across the canal started to play a song with a familiar type of cadence and even though I couldn’t understand the words, they didn’t sound too deep. The crowd, including the children, started to sing along. I used my zoom lens to catch a picture and when I looked at the photograph afterwards on my camera I noticed something odd. 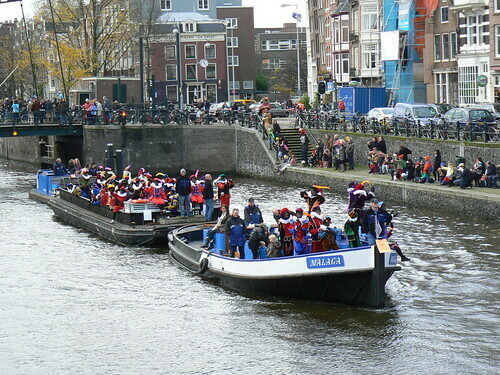 Shortly after that, boats and boats full of people dressed similarly came down the canal. 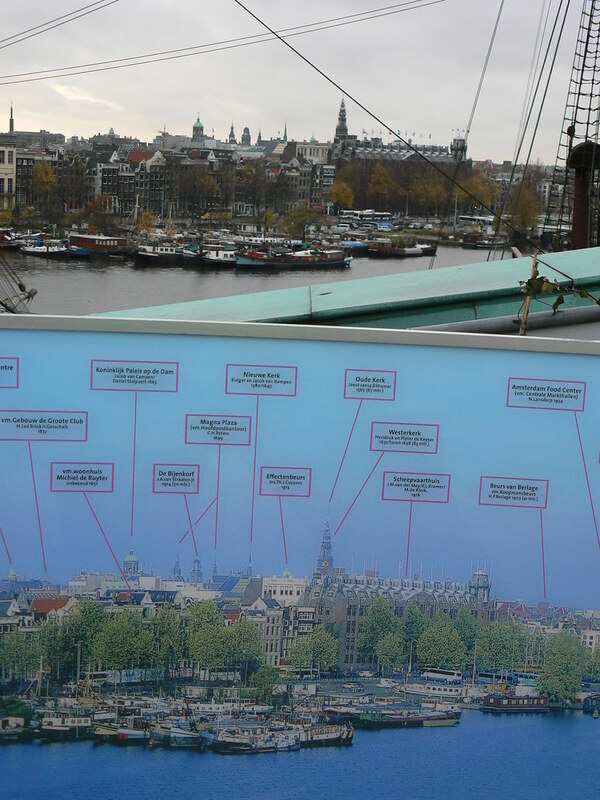 Ryan and I left Amsterdam still unsure of what exactly we had seen. 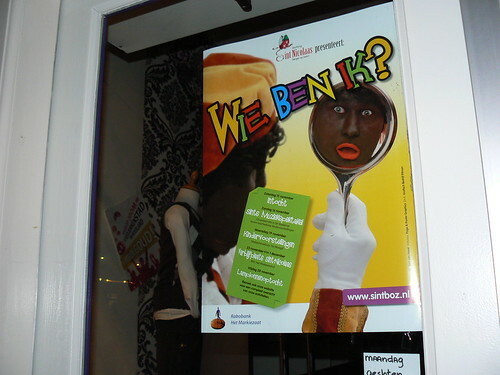 In our next destination, Bergen op Zoom, we kept encountering the same character. 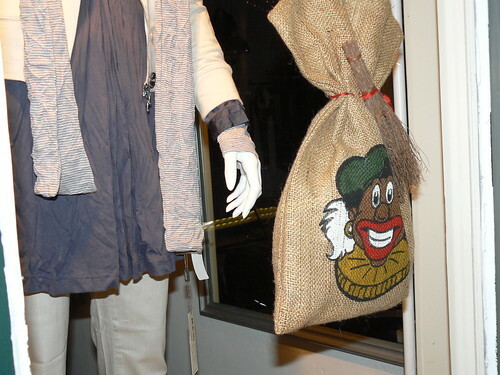 He seemed to be making an appearance in most store fronts. It took a couple of days before us confused U.S. visitors solved the mystery (Hat Tip, Google Search!). 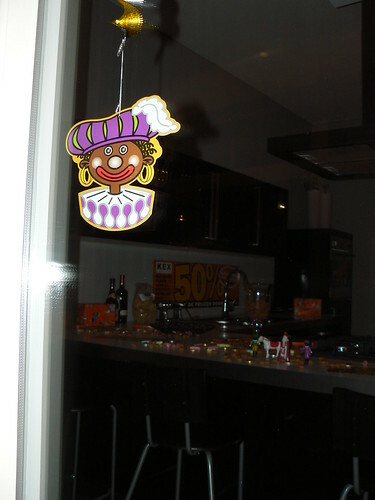 And so, I introduce you to Zwarte Piet. 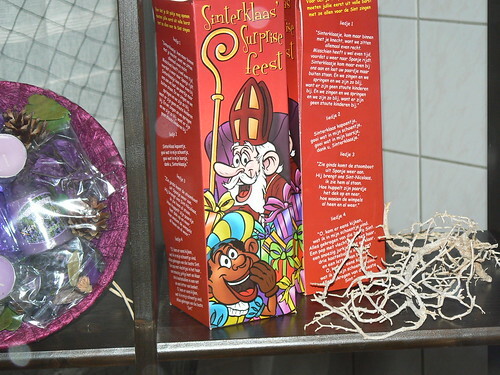 He’s Sinterklaas’s helper! Which means, my first guess at the parade was not that far off. 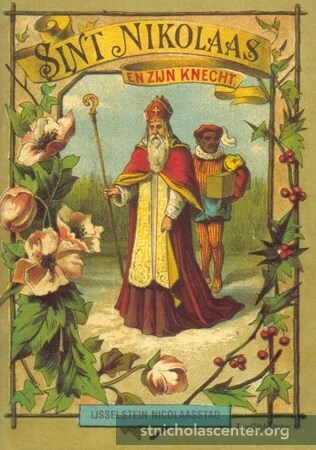 Zwarte Piet first showed up in a book by Jan Schenkman in 1845. 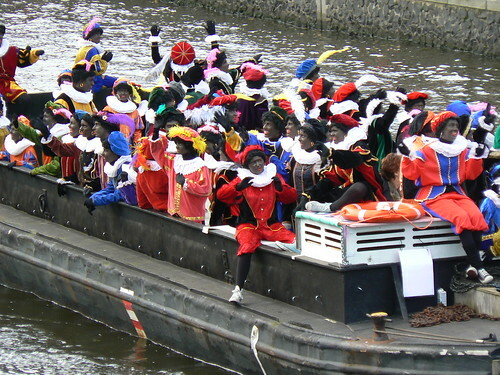 In the Dutch culture, both Sinterklaas and Zwarte Piet spend their off-time in Spain (because it is warm!). Our Santa Claus with his North Pole is pretty much the biggest sucker ever. 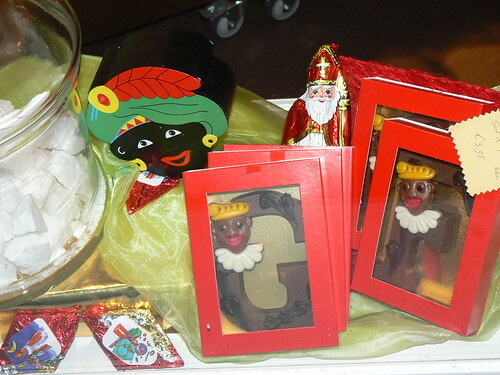 After WWII, it was obvious that one Sinterklaas and one Zwarte Piet could not handle all of the holiday workload. They needed more resources. 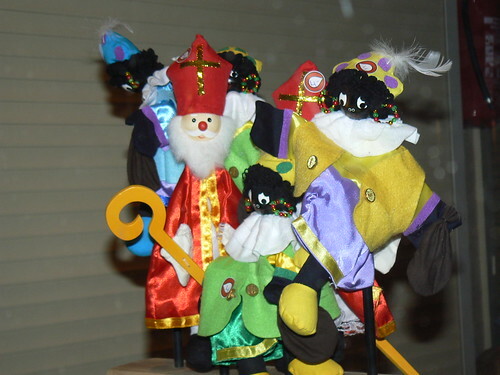 There really could only be one Sinterklaas, so Zwarte Piet multipled. 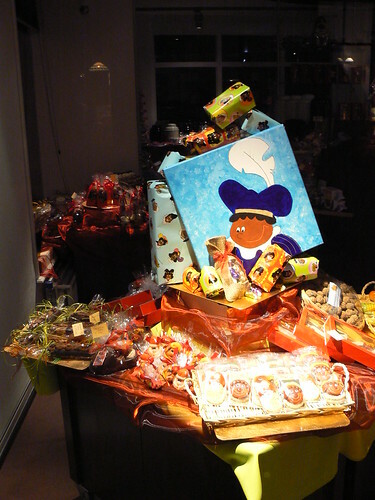 Now there are tons of “Zwarte Pieten” and they remind me a bit of Smurfs. 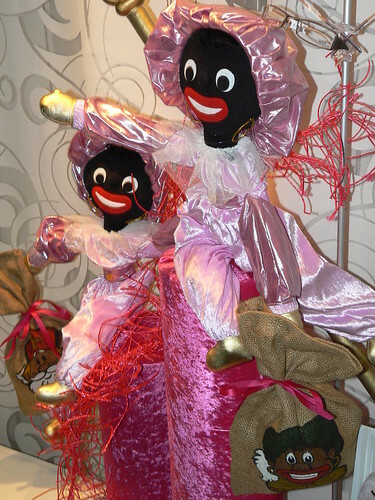 I wonder if that means Zwarte Pieten could also explain the Tragedy of the Commons? 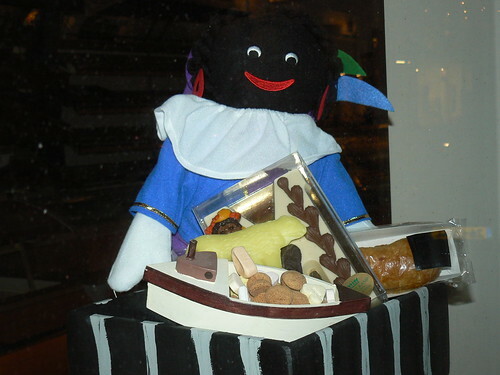 Although I could not tell from the excitement of the parade or by his prominence in advertisements, Zwarte Piet is controversial. I think some of the strategies to make him politically correct are…amusing. Some explain his skin color by pointing out that he has to go up and down chimneys. He is merely covered in soot. 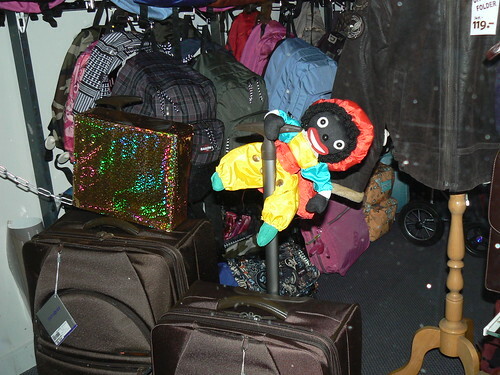 In 2006, “Coloured Petes” were introduced. 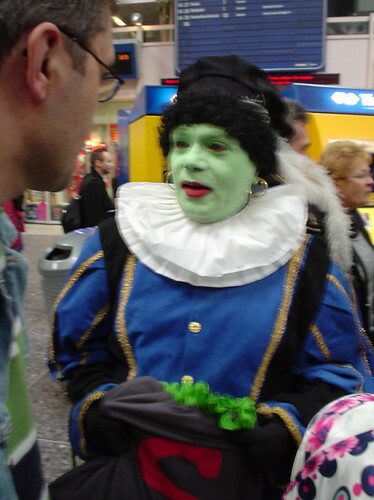 Instead of black face paint, they donned other colours such as green and purple. How did they explain this drastic complexion change? Sinterklaas passed through a rainbow with his boat. 🙂 And yet, even with that impenetrable premise, the Coloured Petes did not catch on. The very next year, they were back to normal. Two grown men (one involved in the church, no less!) preparing to smuggle children out of the country. 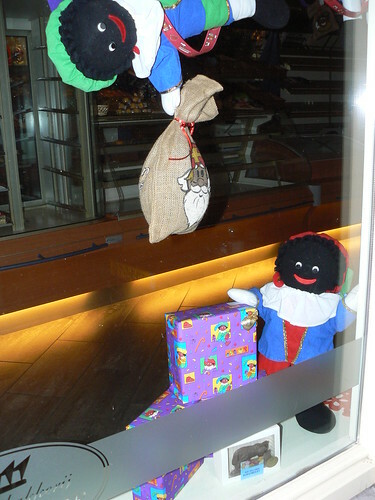 More pictures of Zwarte Piet can be found on my Flickr site.